Book marketing is a never ending process, and one that should start well before you publish your first book. One of the most important things you can do early on as an author is to build your author platform. This is an ongoing process that can begin long before you even write a book. 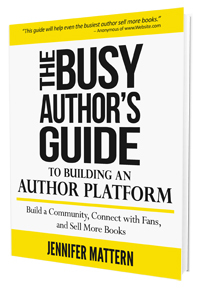 In the end, building an author platform is about effective author PR — relationship-building, building visibility, and becoming recognized as an authority source, which is especially important for nonfiction authors. Your author platform helps you reach and connect with the people who will later become your readers and customers, and it does so without pushy marketing and sales tactics. Building an effective author platform takes time. And authors are busy people. That’s where this e-book will come in. I will put my years of PR experience working in creative markets to work for you, helping you build a better author platform in a way that makes sense for your promotional goals, your comfort level with different promotional styles, and your schedule.